I spend plenty of minutes each day on social media. I have accounts on all of the well-known social media platforms. I don't use all of the accounts, but I have them. If I am honest, I didn't want to be on social media. I felt compelled to keep my Facebook account because of my blog's page then I added some of the other platforms because no matter if I was a fan or not social media wasn't and isn't going anywhere. My daughters first social media accounts were on Musical.ly. I had no idea they had accounts until they decided that they could no longer keep their secret under wraps. It was bothering the both of them that they were doing something behind their parents backs. We didn't make them disconnect their accounts instead I created an account too. They created their accounts because some of their friends were on the platform and suggested that they join too. I was able to see how they used social media, and from where I stood they used it pretty responsibly. Since my girls have been on social media for some time, I have found what works and what doesn't works. Which platforms are okay for them now and which platforms will have to be placed on hold. Musical.ly ended up needing to be placed on hold because it had too much going on during a season. The changes on the platform had negative effect in our home. One thing I've learned is that my daughters are susceptible to the influences of others and each is affected differently. The need to leave Musical.ly didn't mean all social media was off limits. My daughters are still able to use other platforms because lessons are still able to be learned. For instance, removing Musical.ly from being consumed taught my daughters that indirect actions of others can have an impact on them, and at times, the impact might be negative. It also revealed to them that they have parents who will fight against any negativity that will try to overcome them. Now they have the opportunity to intentionally search out platforms that do not harm them, but instead inspire them. I also realized that by dropping several of the platforms and only keeping one or two allowed me to be more intentional with navigating social media with them. It's hard keeping up with the different changes and main influencers on each platform, but if there's only one or two I can remember what is going on where and we can have open conversations. When we dropped Musical.ly, I gave the girls permission to use Instagram since it still has options for videos, photos, and stories. It is also one of the platforms I spend the most time on so I felt it would be easier for me to help guide them without hovering too much. Allowing them to use Instagram, also made more space for me to help guide them in making better connections versus following random folks and having random people following them. As a mom who follows tons of other homeschooling moms, I was able to reach out to moms I admire and connect my daughters to their daughters. They are also able to follow other inspiring teens and tweens like Alena Pitts and Paper for Water. I believe if they are going to be on social media then they should at least consume visuals and words that will feed them versus hinder or harm them. Since Musical.ly was their first platform, and I had no idea about it, they were already caught up in how many followers their accounts had which meant their accounts weren't private initially. Now this--bothered me. But what was done, was done. I had to help them unlearn that numbers were the focus, but instead the focus should be connecting with like-minded people and making sure that whoever is following you doesn't have ill-intentions. Being caught up in numbers can have a negative effect on young people just the same way it has a negative effect on adults. In some of my blogging and entrepreneurial circles, there is often talk about not having enough followers which can make the creator of the content or product feel like their offering isn't enough. We know that our worth or work isn't based on followers, but in such of world where numbers are used as a measurement of success it can be hard. All of their accounts are now private, and I have access to them. I don't typically read their messages because the only way I can trust them is to trust them, but I have access so I can periodically check to see who is following them and block, if needed. I know that they are still young and part of my job as their parent is to keep them safe so this falls under keeping them safe. I also have limitations on what they can share on social media. They aren't to take photos with license plates, share their exact location, tell all their business, pictures have to be tactful, and of course, words have to uplift, empower, or tell a story. I don't want them putting harmful stuff out there, and now I can say they don't want to put harmful stuff out there because they've seen the effect other people's words and behaviors can have. Social media isn't my favorite thing, but I can't deny the impact it has had on my life. I've found moms who inspire me on my homeschooling, business, mothering, marriage, and womanhood journey. I've learned about new ways to do things. I've learned about opportunities and places to visit. I can't say that I would've experienced such moments if it weren't for social media so instead of fighting against I am choosing to help my daughters make the most of it for themselves. 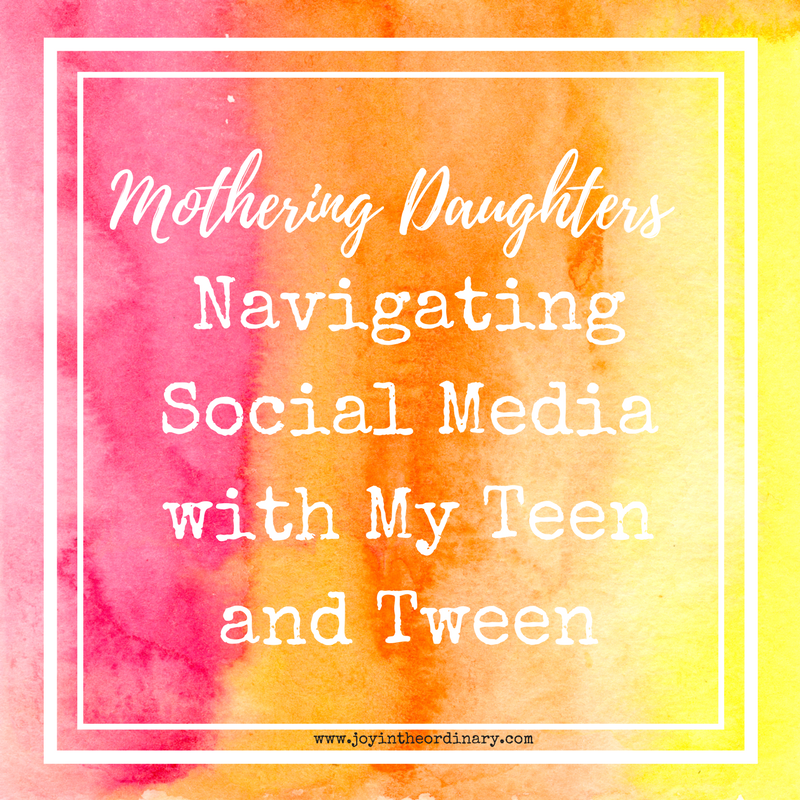 Does your teen or tween use social media? How do you navigate the different platforms?